Bamboo Garden Border in Natural Black color measures 1" in diameter and 12",10",8" in staggered height and each piece is 4ft long totaling 8ft. Our black bamboo edging can be bent straight if you prefer. 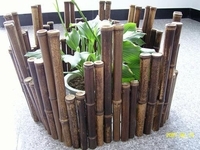 Bamboo garden edging adds a personal touch that makes it more attractive. At the same time you should stick closely to the exterior of your home so that the garden fencing matches the aesthetic of the rest of your house. If you would like to order large quantities please email for quote.